Plans call for a six-story development with stores, offices, restaurant, and apartments. 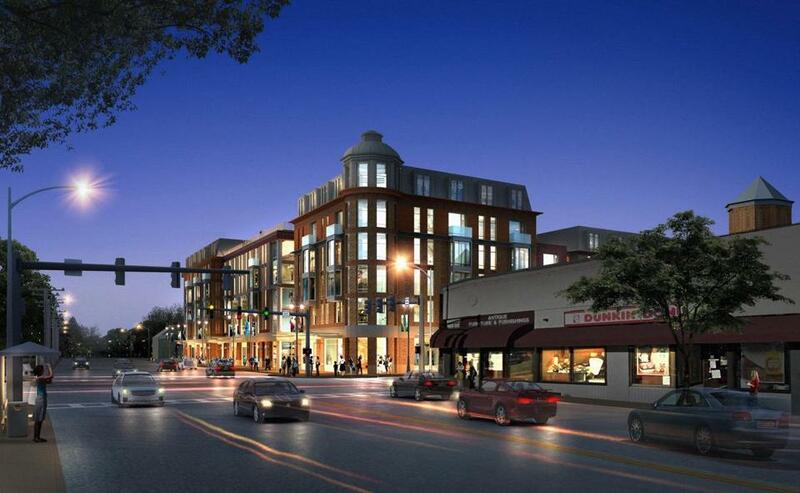 NEWTON — A local developer unveiled plans Thursday to raze a tired block of buildings at the corner of Washington and Walnut streets in Newtonville and transform the area into what he says will be a vibrant destination benefiting the entire city. Robert Korff said his plans are to build a six-story, mixed-use development with stores, offices, a restaurant, and 151 one- and two-bedroom apartments, 26 of which will be set aside as affordable. There would be underground parking for around 190 tenants’ cars, and surface parking for 93 cars. The development would replace eight buildings that now house several businesses — including Karoun Restaurant, Boston Ballet School, and Newtonville Camera — and approximately 10 second-floor apartments, eight of which Korff said are now occupied. The proposal must go before the City Council for approval. Korff outlined his plans at a community meeting at Newton North High School Thursday night before an audience of about 200 residents. In an interview before the meeting, Korff said that while he is passionate about what he sees as a linchpin for development along Washington Street, he also understands there will be opposition. The proposal comes on the heels of the City Council’s narrow vote in December to approve plans for a 68-unit housing and retail complex on the Austin Street municipal parking lot, just across the Massachusetts Turnpike from Korff’s proposed development. At Thursday night’s meeting many of the same people who opposed Austin Street raised similar concerns about Korff’s project, opposing its size and warning that area parking would be inadequate and traffic congestion would grow worse. They expressed concerns about displacing small businesses and tenants at the site. Kathleen Kouril-Greiser, a vocal Austin Street critic and founding board member of the Newton Village Alliance, thanked Korff for reaching out for neighborhood feedback so early in the process. She then challenged Korff to spend his money and use his influence as a catalyst to form a local, state, and federal partnership to make a pedestrian greenway over the Mass. Pike from Walnut Street to Lowell Avenue a reality. City Councilor Susan Albright, who represents Newtonville and supported Austin Street, said it’s a given that there is a clear need in the city for diverse housing. But, she said, there are other factors she’ll be considering before making a decision on Korff’s plans, including whether they will fit with the character of the area and meet criteria set by the planning department and land use committee. “We’ll have to wait and see whether he incorporates any of what he heard tonight into his plans,” she said. Attorney Stephen Buchbinder, who is representing Korff, said the review process will likely last throughout the year, with a final two-thirds vote needed from the 24-member City Council to approve the plans. In an interview before Thursday night’s meeting, Korff said he’s ready for the debate. The 56-year-old Lynn native has lived in Newton for more than 20 years. He said his life was sailing along just as he planned, with a successful career in real estate development building Walgreens drug stores across the country, a happy marriage, a son, and a daughter. That life ended when his wife Marjorie died in 2006 after a long illness, he said. “It took me a long time, personally, to get through that,” he said. Korff said he had planned financially for his and his wife’s future together, and envisioned the pair traveling, and living the good life by this time. He said he’s had to figure out another option. He found it one Sunday afternoon last year. Sitting on his couch with his dog on his lap, Korff said, he was on his computer checking out different properties in the city when he came across this particular block. The next day he set up a meeting with the Nicolazzo family, which owned seven of the buildings, and then with the J&M Realty Trust, which owned the eighth. “I liquidated all the assets I had set aside for the future I’m never going to have,” he said. In addition to those eight buildings, Korff said he has an agreement to purchase the adjacent property where there is a Sunoco gas station, and four multi-family homes along Washington Terrace. He also said that he’s been talking with the owners of property adjacent to that, between Washington Terrace and Lowell Avenue. For now, however, he is moving forward with plans for just the eight buildings he said he purchased outright, with no contingency that his development plans be approved, for $22.5 million in a sale finalized last month. Plans will be formally filed with the city in the near future. Korff said he is committed to working with each of the tenants to relocate when the time comes, including residential renters as well as the businesses. “This is people’s lives being affected, people’s businesses, I get it, I’m sensitive to that,” he said. He also said he very specifically decided on six stories because of the project’s location on the corner of a busy road with visibility from the Mass. Pike. The current zoning at the site allows for a five-story building with a special permit; the added floor will require not only the special permit, but also a variance from the City Council. Korff said that while he thinks six stories are appropriate, it’s something that will be up for discussion. He suggested that in exchange for the extra story he might be willing to add more affordable units than the 23 proposed, he may be able to add some moderately priced units, or offer off-site mitigation. The six-story, mixed-use development would replace eight buildings that now house Karoun Restaurant, Boston Ballet School, and other businesses. Ellen Ishkanian can be reached at eishkanian@gmail.com. Follow her on Twitter @ellenish1.